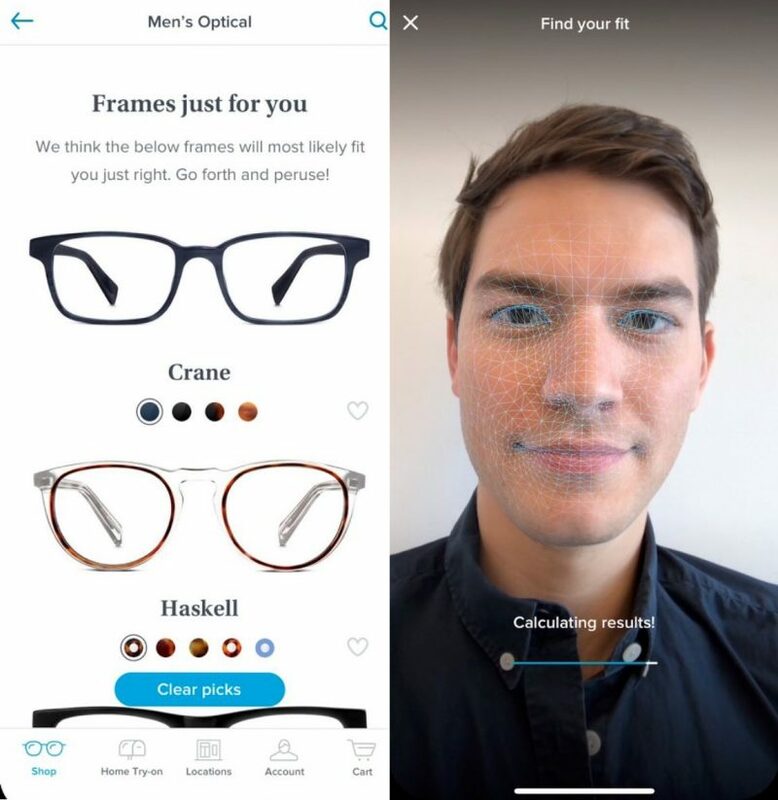 Spectacles company Warby Parker recently updated its mobile app to include a novel implementation of Apple's face recognition technology exclusive to the iPhone X. The glasses app uses the smartphone's front-facing TrueDepth camera to map the user's face and create an ideal fit for a new set of frames. Apple's Face ID authentication works by projecting 30,000 dots on the surface of a person's face, accurately mapping its curvature and unique features. The camera's sensors also capture the data in three dimensions, and it's this technology in particular that the glasses app uses to recommend to the user a series of frames that it thinks will fit their facial structure. The only failing of the app is that it doesn't (yet) place the spectacles on the user's face, Snapchat-style, to let the customer see what they look like wearing them. Apple's ARKit augmented reality framework would seem to be the obvious solution to this lack. We've reached out to Warby Parker to ask if they have any plans to make use of it, and will update this article if we hear back. This is seriously revolutionary stuff when considering the long game. In five years' time this sort of example will be second nature and we'll never know how we did without it. That's what Apple have fundamentally achieved over the years; great technology that has practical use in real life. Eventually the 'technology' aspect fades away, becoming part of the every day and ultimately indispensable. Whilst this is really cool I have to wonder. I'm not a conspiracy theorist and I'm not paranoid, I don't have any trust issues when it comes to using FaceID or TouchID data being sent off to whomever by Apple, but when it comes to 3rd party apps I'm not so sure. Maybe someone can shed some light on this for me. Does the app send the data it mapped to the company? Is this mapping any different from what FaceID does, maybe less accurate? Seems as though third parties can in fact collect face data. Granted It’s with the user’s consent to use the app, but it’s still contrary to what Apple said before. This is exactly the sort of thing I’m excited about moving forward. Warby Parker is already leading the pack in terms of virtual fittings, I can’t wait to see what they do next. I’ve worn glasses or contacts since I was five (in 1979), and I have not-so-fond memories of trying to see what I looked like with empty frames, yet being so near-sighted that my face had to be within inches of the mirror. Trying on new frames while wearing contacts felt miraculous by the time I got to high school, this is next level stuff. As far as I can determine developers have access to true depth information from the camera system, which is different than Face ID data. Apple provides them with the ability to access like 50 or so measurements from the true depth camera system. But they don't have access to any of the Face ID data or the algorithm that creates and checks for Face ID. Great idea! You’re working from home - and your boss calls! Your boss sees you as described in Avieshek’s post! It’s truly that scene from The Jetson’s — that cartoon show from the mid-60’s, predicting life in the future! What’s available to 3rd party apps is only part of what makes the Face ID work. They get limited information compared to what the phone can actually do. I can’t remember in which article, but I read that Apple gives access to a dumbed-down version, and that it’s not enough to extrapolate back to a true face. I wish I had bookmarked it when I read it, because this is a legitimate concern that I believe has been addressed already.